Jan Gustavsson and Håkan Kellner have brought back "Apriori" to Sweden, planning to restore her to original beauty. Thomas Natthorst raced this boat under the name Tomatoe 1969 and 1970 in Sandhamn and Sydney. In Sandhamn 5.5 World Championship 1969 he was 3rd (Sundelin Br. was 2nd) with crew Håkan Linquist, Claes Boje. Result was 1-8-4-3-11-3-3 39.1 points. In Sydney Natthorst got to the Gold Cup finals with score 1-?-? finals 3-3-2. In the World Championship he was among the best six or eight? Håkan Kellner and his brother Rickard built the boat together with Jan Gustavsson at Rosättra during nights and weekends. 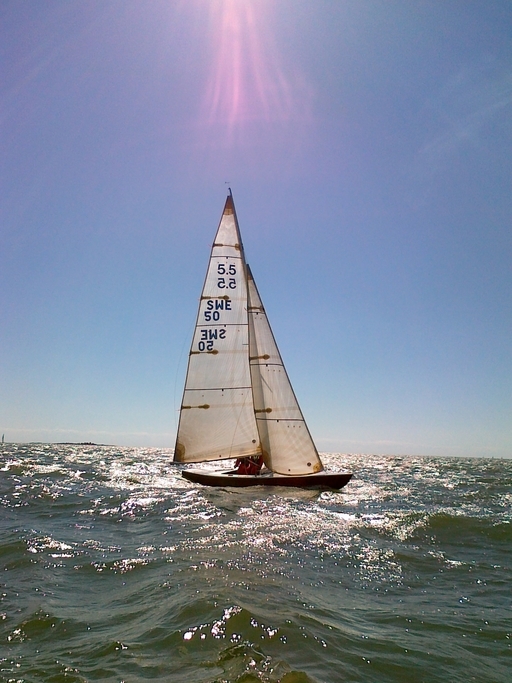 In the summer of 1968 they sailed the Olympic qualification sailings and also the Europeans in Switzerland. In the autumn -68 Nathorst bought the boat and named her Tomatoe. He is believed to have put a separate rudder on the boat in 1970.